LUNA is a seasonal, Limited Edition mask that is available only once or twice a year. You can mark your calendars for Spring 2019, because that is when Toni will be bringing us this manna from heaven! Why am I so obsessed with this? Well, let's dive deeper! 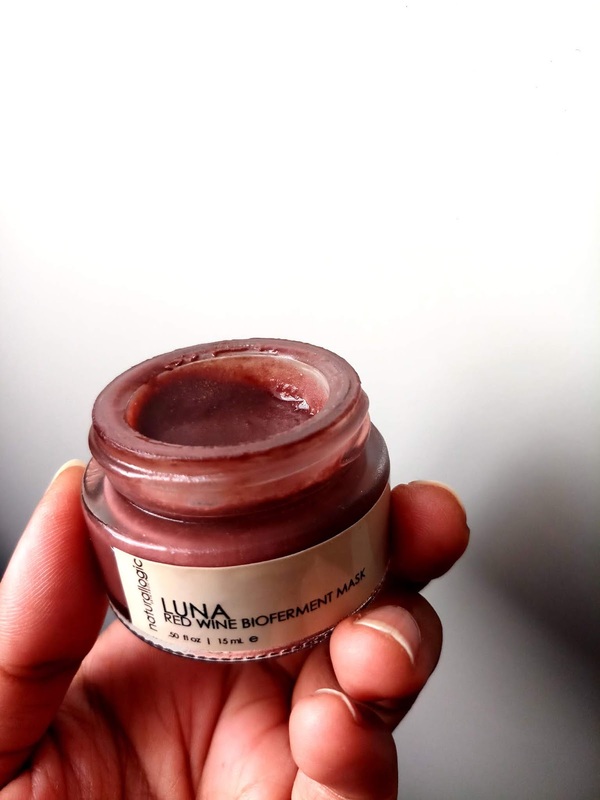 LUNA goes on the skin like a dream, specifically like a cream. It's so soft and pliable that I apply it on every bit of my facial skin and neck, even under the eyes because I want every pore of mine to be suffused with its hydrating properties and antioxidant goodness. You guys, this is DA BOMB when it comes to infusing skin with hydration that lasts. I typically look for hydration in serums and moisturisers but this is the only mask that beats even serums/moisturisers in moisture retention. Once I wash it off, I'm left with baby-soft skin, and I really mean baby-soft skin, with the most radiant, healthy glow one can get. I don't even feel the need to apply a moisturiser after washing this off. But for my peace of mind and to protect my skin after using the mask, I apply the Earthwise Beauty Resiliency Serum (previously Carrot-a-Day Serum) as it is lightweight yet potent. I think the serum works beautifully on top of skin treated with LUNA. I imagine this mask would give too much of a glow during summer season, but being dehydrated-prone, I see myself welcoming this in my routine whenever my skin would feel dry and lacklustre. Due to the way fermentation causes exponential nutrient bioavailability, it is enormously rich in naturally occurring resveratrol, vitamins, minerals, antioxidants, phytonutrients, fatty acids, amino acids, mannoproteins, antibacterials, antimicrobials, lactic acid + polysaccharides. It reaches deep into skin's surface layer, infusing it with these nutrients while deeply hydrating + moisturizing, cleansing pores, neutralizing free radicals, gently yet powerfully exfoliating + breathing vitality + life into thirsty skin. It creates an unbelievable exfoliated, bright, plumpy, fleshy, healthy glow. I was sold the moment I read all this, because it basically means that the mask is a skin elixir and a multitasker. Apart from all that ferment-y goodness, LUNA also includes raw honey, raw cacao and many other gorgeous ingredients. Just check out the inci list. I’ve been meaning to write about my Earthwise Beauty haul for quite some time, but did not get around to it until now. Well, better late than never! I should have known that this post would be a long one. Hence, I have segregated it into two parts. The following is Part 1 focusing on the skincare items of this haul. Stay tuned for Part 2, which will focus on the Dandelion Tea and Essences. First off, the Miron glass and the coppery, rose-gold labels in a quirky, fairy-ish font! Ava has retained the mystical quality of her brand through these new labels. And she could not have done a better job than this! While many, including myself, are wistful about the older packaging, I applaud Ava for changing with the times and doing what’s right for her brand. 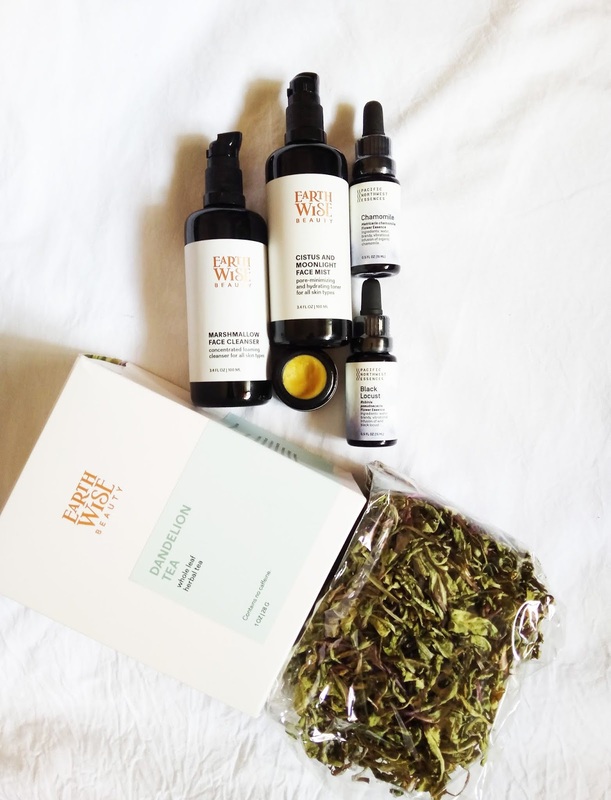 Without the Miron glass packaging, her products would not have made it to brick-and-mortar stores in all their freshness and potency, which is one of the most unique differentiators between Earthwise Beauty and many other brands. Honestly, no other brand that I have tried so far has come close to Earthwise Beauty in terms of freshness. And as far as brick-and-mortar stores go, Earthwise Beauty products have just recently made their debut in one such beautifully curated boutique. So, kudos, Ava! The efforts are paying off. Next up, the Marshmallow Face Cleanser, previously called Marshmallow Suds. This is such a beautiful cleanser. It is no-fuss with minimal but effective ingredients and super hydrating. It lathers just about enough, which is perfect for me. It’s almost like a Goldilocks situation—too much lather strips my skin, and too less does not feel like it’s working. The Marshmallow Cleanser has hit the right spot for me. The cleanser composition has been tweaked recently, with one or two ingredients switched out or replaced, and I can say that this has definitely improved its scent. The sample I had of the previous formulation did not smell as pleasant as this new one does. It does not smell like a valley of flowers in case you’re wondering but that’s what I like about it. It has an earthy, herbaceous scent with just a tinge of floral. I use this cleanser twice every day, without fail. I should get a back-up because I cannot do without it. I will either use it as my solo cleanser in the AM or as my second cleanser in the PM. But here’s a novel way to use this cleanser. You know how I like to experiment with my products, either making concoctions or using them differently. So, here’s what I like to do with the Marshmallow Cleanser. As part of my recent experiment to pare down my skincare routine/stash in an effort to be more minimalistic, I'm trying to eliminate the toner step and use this instead. I have been massaging this cleanser on damp skin (after I’m done with my first cleanse typically with an oil or balm) and then wiping it all off with half a cotton pad (half because I’m trying not to generate too much waste). You’d be surprised by the residue on the pad even after doing a first cleanse. I like to do this because I live in a highly polluted city so I’m never satisfied with a single cleanse especially in the PM. If you have this cleanser, try using it this way and let me know how it goes! My ultimate hydrating mist ever! I love this to bits and I must thank Andie of @andiethegreenqueen for introducing this to me. The way she had described its scent, I was sold! And I have been a fan ever since. Many mists in the green beauty market are too hydrating for me, sometimes leaving a thin film or an oily look behind. But not this! This absorbs so quickly (it is mostly cistus hydrosol and aloe vera juice and just a tinge of cistus essential oil) thus leaving behind a velvety matte feel. For an oily-combination skin like mine, that’s very important. I will forever have this baby in my stash. I have reviewed this on my blog previously (click here and here to read) but I reiterate here that this mist is more than a mist to me. I feel calm and composed and ready to face the day when I use this in the mornings. Likewise, in the PM, I feel grounded when I apply this after cleansing. The gem and flower essences used in this mist must definitely be working on me, which is why I feel calm, composed and grounded. When using this from a spray bottle, I had realised that so much product was getting wasted due to spritzing. And since I did not want to waste even a millilitre of this, I requested Ava to provide me a pump so that I could pump this into my palm and pat it into my skin like a Korean essence. I was right! I love using it this way and no wastage of product whatsoever. I even take any leftover product up to my hairline. It helps to smooth any flyaways! One product and so many ways to use it! I still have the bottle from the older packaging so if I’m ever in the mood to also use this as a spritz, I know I can. Plus, I love the older packaging so much, I just don’t have the heart to throw it out. I never thought I would like any other balm except Tigress Face Balm, even if Ava herself came up with one. But I can see why Yasuni Face Balm is such a winner. For the record, I still prefer Tigress but what sets Yasuni apart from many balms on the market is that it’s a treatment balm. I think Ava should have put the words ‘Treatment Balm’ on the label itself, because this does not simply hydrate or lock in moisture. This treats and exfoliates the skin the way many high-end serums do thanks to its enzymatic action. And unlike high-end treatment products that sting the skin, this does none of that. I see every skin type and condition benefitting from using the Yasuni Balm. I saw my clogged pores getting cleaned up by the day, which is not an easy feat. When Ava, in one of her Instagram posts, said that one can use this balm as a moisturiser, I was excited. But when I saw the texture of this balm, it appeared like a solid balm (it’s not as juicy as Tigress) and I was confused how this can be used as a moisturiser. After a few seconds of head-scratching, it occurred to me that maybe I need to warm it in the palm of my hands. And so, I did. The balm melts into a light to medium-weight oil due to the heat of your touch and can then be used as a moisturiser. I still prefer to mix a drop of Ferns and Moss into this for reparative effect or a smidgen of Tigress and Farizad’s Veil to make a skincare-sunscreen-treatment product. I love that it is formulated without essential oils so that makes it apt for sensitive-skin folks. I will admit though that I’m not a fan of its scent, as it reminds me of bitter medicine but when you think of it, that is precisely how it acts on your skin. It’s medicine! I already think of Ava as a medicine woman, and this reaffirms my thinking. So, that’s it folks! As usual, I have rambled on and on but I can’t help it. When I love something this much, I have to share my thoughts with you, skinsleuth style! Stay tuned for Part II of my Earthwise Beauty haul. Have a lovely week ahead. One of the most recommended skincare tips for dealing with oily, clogged skin is to perform regular steam sessions. And while I've been doing this for many years now, I found no real joy in doing this. It always felt a bit mundane and oftentimes I would skip it and jump to the more interesting steps such as masking and serums. Until I had in my hands the Mahalo Blooms... the glammed-up version of an insipid face steam. Released as part of the 'Winter Grace' holiday collection early this year, this was available for a limited period only, I think in Feb-March. So, when my aunt asked me what I wanted for my birthday around that time, I chose the Mahalo Blooms. Of course, everything Mahalo makes is lovely but had I wanted to try this steam especially after looking at its ingredient list (given below) but more so because Maryna, the owner of Mahalo Skincare, makes the freshest of skincare combined with exquisite aromatherapy benefits. I knew I was in for a treat! One look at the ingredients and you know the scent is going to be beautiful. I wasn't disappointed when I first opened the jar and breathed in its aroma; it's such a complex spicy + floral scent. Sometimes, I treat myself by opening the jar and breathing in deep. The steam claims to to repair, rejuvenate, balance and purify, and is a perfect step to add in any home spa ritual. Since I don't go to salons for facials (haven't gone in years, as I have all the tools and products necessary to do my own facial at home plus I think everyday skincare is a better way to invest in your skin), a steam session at home is such a great step to achieve clear skin. I truly enjoy the ritual of boiling a pot of water, adding a tablespoon or so of the steam and watching the seeping process. It's so soothing to the senses! But the cherry on the cake is what it does to the skin. After the steam session, I always perform extractions and my skin looks so much clearer and smooth to the touch. One session per week is enough to give me clear, smooth skin for the next seven-eight days. My current skincare routine, which I have pared down drastically, as part of a personal experiment, is also helping in keeping my skin clog-free. I can honestly say that the combination of a steam + the right kind of skincare routine does wonders. 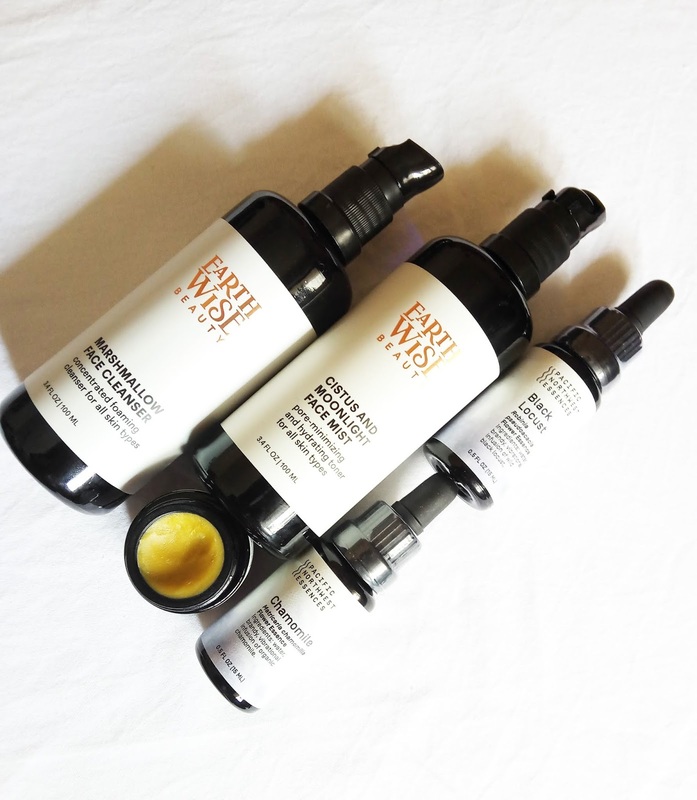 I'm now looking forward to trying the Earthwise Beauty Selene steam, which is said to be reparative for acne-prone skin, plus you all know how much I love Earthwise Beauty products. I had tried a sample of their Aphrodite steam previously and loved it. It was so hydrating and soothing for stressed-out, knackered skin. Bottomline: invest in a good facial steam, especially if your skin is prone to clogging. The results are instantaneous and beneficial in the long run. Have a great week ahead! My thoughts on this gentle, all-natural liquid exfoliant are mentioned here, but you'd see that my opinion on this exfoliant treatment toner hasn't changed much. I still think that my skin is too resilient to notice any exfoliating effect from this product. That said, it may be a good option for those with sensitive skin, who want to try exfoliation but are feeling unsure about it. After using up half of the bottle's contents, I used the remainder to spritz on my face to prevent certain clay-based masks from drying up too soon. It seemed to work well when combined with other skincare products such as the Earthwise Beauty Frightening Green Mask, Blackstrap Molasses Mask, etc. The Hawaiian Beauty Water has gorgeous ingredients such as hibiscus, coconut water, papaya enzymes, willow bark, witch hazel and more. I only wish it worked on my skin! I love this mist to bits! Previously reviewed here on my blog, the scent of this mist is completely unique and unlike anything else on the market. The floral, honey-like scent laced with a touch of green makes up for a such a soothing ritual, be it in the mornings or at nighttime. In the morning rush hour, this slows me down for a brief few seconds and in the evening, it calms my frazzled, often overworked self. Performance-wise, this hydrates my skin without leaving behind a greasy after-feel, which so many other mists do because of the inclusion of oils. This is yet another product that is free of essential oils. I'm so glad to see Ava repackage this mist into a 100 ml bottle because the 60 ml runs out pretty soon. This was my first bottle of the Ambrosia del Cerrado from Earthwise Beauty and like every other product from the line, this doesn't disappoint. Although Ava describes this as a moisturiser, I think it also has slight treatment-like properties. What I mean is, it doesn't just hydrate the skin but also lightens spots when used consistently over a period of time. In a way, it's a grown-up moisturiser. The colour and the scent are so refreshing, but what I appreciate more are the ingredients and the performance. It's one of the few green beauty products out there that is free of essential oils and therefore safe for everyone to use. The Ambrosia also pairs very well with Earthwise's Ruby Facial Oil (also free of essential oils), sharing not only a few ingredients such as pequi and buriti oils but also the scent profile, obviously due to the same ingredients. I love to mix the Ruby oil with the Ambrosia into an emulsion, which is what I reach for when I'm short on time. My Ruby oil is long gone but this moisturiser is still good on its own. I'm currently on my second bottle of this. You can find my review on this here. Previously reviewed here and here, this is my second-time purchase of this serum. I was blown away by it the first time around, and I'm still blown away by it. The serum is a potent combo of deep yet lightweight hydration (thanks to the Indian Senna seed extract) and brightening (mostly due to liquorice). The only thing one needs to keep in mind is, don't use this as a moisturiser. It is formulated as a serum for a specific reason. The botanical hyaluronic acid in it requires that you top it up with a regular moisturiser otherwise the hyaluronic acid in it will draw moisture out of your skin; the serum therefore needs to be 'sealed in' with something on top of it. Also, if you don't use a moisturiser on top of this, it leaves a slightly sticky feeling (similar to conventional hyaluronic acid) which is not pleasant. Included in a Boxwalla beauty box last year, this face oil is lovely, with a lush scent and feel and a performance that matches its aesthetic value. When I used it alone for several days (as recommended by the brand) I noticed it gave a brightening effect similar to the Earthwise Beauty Ruby Face Oil (also included in one of the Boxwalla beauty boxes). While the Ruby has a spicy, tropical scent, this has a fruity and cookie-like vanilla-ish scent rounded off with a grown-up frankincense. I also like to mix this with the Ambrosia del Cerrado and sometimes even with the Farizad's Veil sunscreen powder. Although it doesn't have the tint of the Ruby oil, it doesnt't leave too much of a white cast despite that. While the Ruby is more easily available, I don't see the Lepaar products stocked at too many online retailers. This powdered mask is quite unsual. Ava's intent behind this was to create a skincare product to address overexposure to sun and skin aging through the use of sun-reminiscent botanicals. While I loved the glow it gave me, I don't think I used it long enough to notice any remarkable effects, considering I had a sample jar, which lasted 2-3 uses. Ava does mention on her site though that this is not a short-term brightening mask but rather a long-term skin investment. 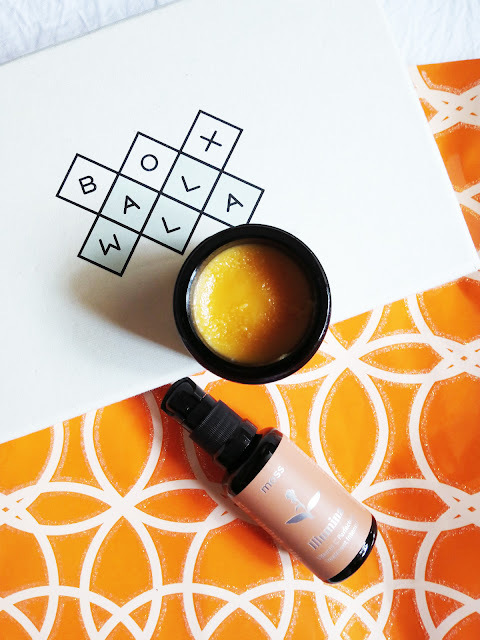 I'm pretty certain that the skincare Gods have descended upon earth in the form of Lavanya, the owner of the bi-monthly subscription box called The Boxwalla. This lovely woman is making waves in the green beauty industry with her excellent curation of the bi-monthly beauty boxes. In the past one year that I have been receiving the #boxwallabeauty boxes, I have skipped only two boxes (yes, she gives you the freedom to subscribe/unsubscribe whenever you want) but the products from the rest of the boxes have become staples in my skincare routine, be it my favourite skincare brand, Earthwise Beauty or the H is for Love Rapha Harmonizing Oil Cleanser, Kinu Body Balm or Lepaar Skin's Precious Face Oil. Lavanya really has her finger on the pulse of the green beauty industry...which is why I was delighted when this skincare God answered my prayers! For a while now, I had been keenly interested in trying out Moss Skincare, a brand reviewed in depth by the lovely Vivian of http://vsafaria.com/. After reading her reviews and that of countless others in the blogosphere, I desperately wanted to try some of their products, mainly Illumina Vitamin C serum, the Beurre Celeste cleansing balm and a couple of other products. So, when I spotted Lavanya 'liking' several Instagram posts of Moss Skincare (yeah, I can be sneaky), I crossed my fingers hoping that the next Boxwalla beauty box features Moss Skincare. Of course, I did a happy dance when Lavanya announced that the June 2018 beauty box would be featuring Moss products, that too two products I wanted to try the most. Celestyna, the brains behind this brand, is highly respected for her experimentation with unique skincare ingredients and for the fact that her entire line is focused on helping acneic skin. Her line stands apart for actually delivering on its claims. 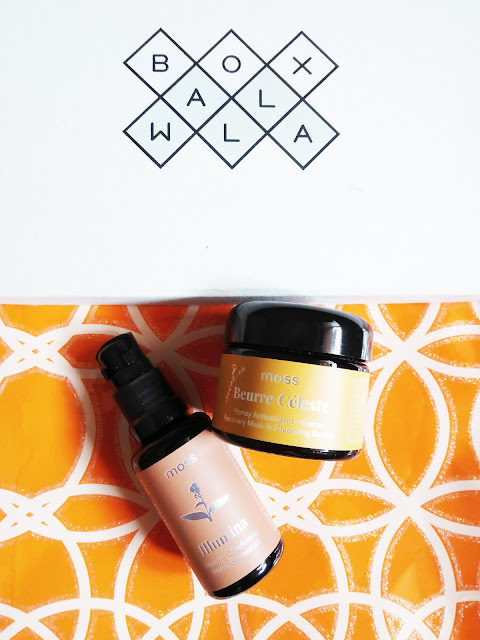 So, coming to the main topic of this review, the June box featured two full-sized Moss Skincare bestsellers, namely the Beurre Céleste Honey Antioxidant Infusion Recovery Mask in Cleansing Baume and the Illumina Vitamin C Perfecting Treatment Intensif, together priced at $215, but Boxwalla subscribers got it for $49 (plus $20 for getting it shipped to India). Even after spending $69 for this box, the value was so incredible that I purchased two boxes, with the intent of sharing with family and friends. My mom is already seeing results with Illumina but let's get into the review step by step. Cleansing balms can vary so much from brand to brand, and oftentimes they can be a miss for several reasons (leftover residue, non-rinsable, etc) but this balm shot up straight to my top 3 favourite cleansing balms. The reason being, it is a brightening mask in the form of a cleansing balm. You'd think this would be obvious because the product name itself mentions that it is a "Mask in Cleansing Baume" but it wasn't obvious to me. 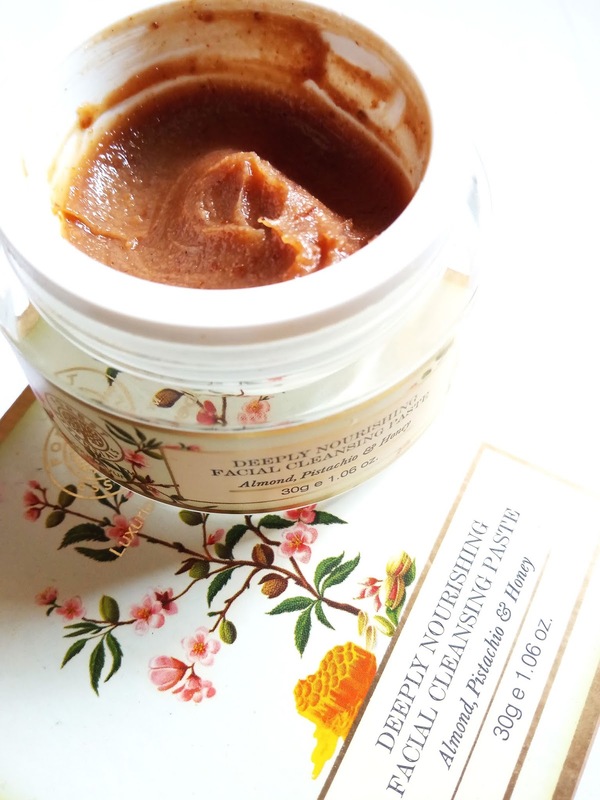 I treated it like any other cleansing balm, scooping out a pea size and massaging all over my face and neck. As expected, it emulsified on adding water turning into a cleansing milk. But when rinsed off, I was left stunned. What I saw in the mirror was a visibly brightened complexion, the kind you'd see only after leaving a heavy-duty brightening mask such as the Mahalo Bean for 30 minutes. But the Moss Beurre Celeste did it in five minutes flat! I remember reading on Celestyna's blog that a cleanser needs to have antioxidants in order to scavenge free radicals resulting out of exposure to dust and pollution, and living in Mumbai, I could not appreciate this more. The balm has amazing ingredients such as honey sourced from Nebraska, sunflower oil, macadamia oil, kokum butter and Sea Buckthorn CO2 extract. I imagine the Sea Buckthorn CO2 is what contributes majorly to the brightening effect, having used it previously in other skincare products with similar results. Scent-wise, I have read such different opinions, possibly because this balm has undergone several iterations over the years, but this latest iteration to me smells like the Thai herb galangal (a cousin of the ginger, with a sharp citrusy aroma) and the desert wind scent of Kokum Butter. I'll be honest, the resulting scent is not my favourite but like I always say, to me performance matters more than the sensory element. Speaking of performance, I love this balm! It delivers what it claims, removing every bit of grime. I even did my 'Toner Test', which is basically swiping a toner-saturated cotton pad after cleansing to see how much residue is still remaining. I'm happy to report that this balm passed the test. I no longer use the toner after using this balm because I don't want to take away whatever antioxidants the balm is leaving on my skin post cleansing. Secondly, the balm leaves the skin so nourished, I feel confident skipping toner and going straight to serums. Now, here's a handy tip for skincare DIY-ers. 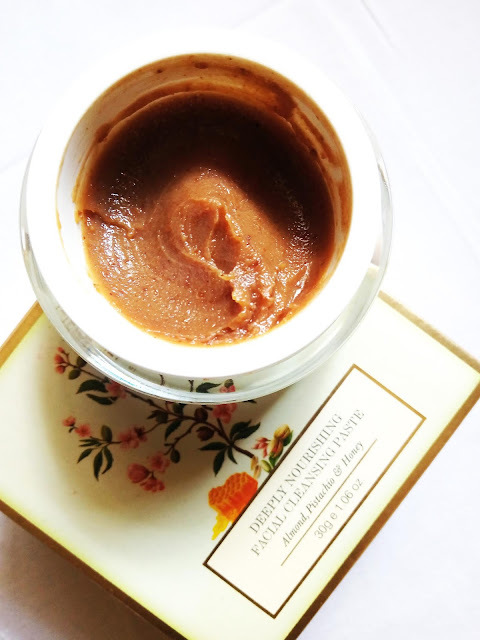 One evening, when I was feeling particularly DIY-ey, I added a 1/4th of a teaspoon of honey to this balm, mixed the two into a smooth paste and massaged it on my face and neck. The additional honey only made it more gooey and therefore more effective when massaged over my clogged pores. I left this 'mask' on for about ten to fifteen minutes. I'm not kidding you guys, when I washed it off, my skin seemed airbrushed, in addition to the brightening effect. Running my fingers over the clogged pores was a joy. I did not feel the grainy texture anymore. I'll be doing this again for sure and I highly recommend you try this out yourself. You will love the results. This, ladies and gentleman, deserves a blog post on its own but let me try to put down my thoughts as best as possible in this post itself. As I'm typing this, I'm reminded of what Lavanya mentioned on the Boxwalla Instagram when describing this product. She said something on the lines of 'where do I even begin'. And now I know what she means. This serum is a like five-in-one serum. It exfoliates, brightens, nourishes, protects, reduces hyperpigmentation, acne and wrinkles. I can't speak to the effects of the last claim of reducing wrinkles because I don't have any but I can attest to all other claims. The unique aspect about this serum is that it not only exfoliates and gives the benefits of Vitamin C, but the botanicals included in it ensure that the fresh skin cells that surface after the dead skin cells are exfoliated are much better in quality. 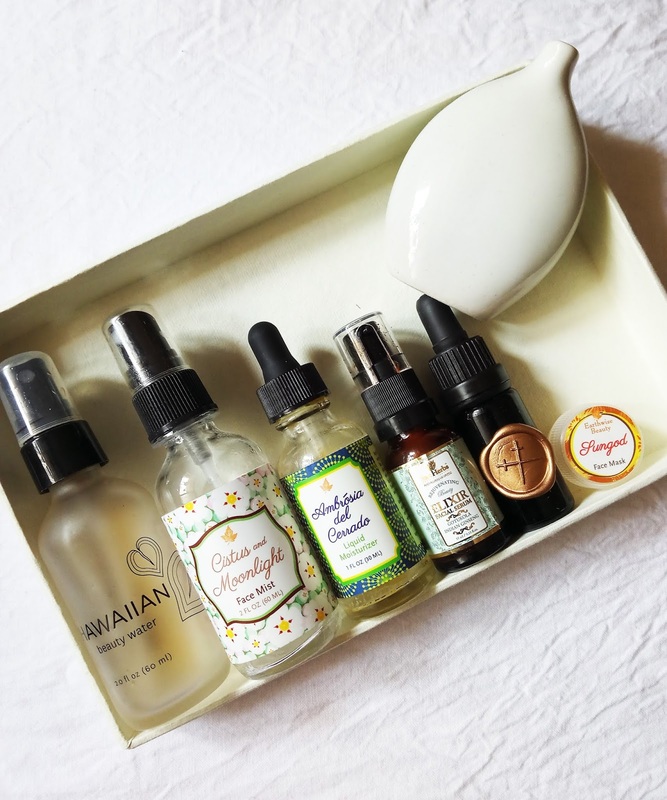 When I received this box, I put everything aside, even my precious Earthwise Beauty products, to try this serum because I wanted to test it exclusively and notice what it does performing solo. After cleaning with the Beurre Celeste, this was the only skincare product that went on my skin for five days in a row. And let me tell you this, my mind was blown! Okay, that doesn't say much so let me break it down on a day-by-day basis. After the first nightly application with one full pump's amount, I hardly saw any effect. The same was the case after the second nightly application. But after the third application, my skin went bam! You know that I often complain about my clogged pores but this baby got rid of a majority of the congestion, along with the redness and acne-related pain that I had at the time. I saw further improvement in my pore situation after the fourth application along with visible brightening and improved hydration. Mind you, this was the only serum/moisturiser I was using post cleansing and toner. While I did feel like using a moisturiser on top of this on the first and second nights, the skin hydration levels were much more improved on the rest of the nights, and I did not feel like putting anything on top of this. Here's why this serum puts every other exfoliating and Vitamin C serum behind: when I saw that the redness and the acne-related pain was gone completely after a couple of uses, it made me rethink exfoliating and Vitamin C serums in general. In all my previous uses of exfoliating and Vitamin C serums, I have noticed that they sting the skin and cause irritation. I have also seen plenty reviewers call this 'normal' when it shouldn't be. Illumina by Moss Skincare defies this conventional belief that exfoliation and Vitamin C causes redness and irritation. On the contrary, it got rid of these symptoms as it focuses on healing acne and giving nourishment at the same time. If you are one of those who have been on the fence regarding exfoliation and Vitamin C, I urge you to give Illumina a try. It is a straightforward, no-frills product that takes care of every skincare need you might have. I especially call it no-frills because with conventional Vitamin C serums that use Ascorbic Acid, you need to give the skin time to let the Vitamin C work at an acidic ph level of 3 or so, before putting on any other skincare product on top of it, which might raise the ph level thereby negating any exfoliating effects. Moss Illumina only requires that you wait a minute or so before continuing with the rest of your skincare routine because it contains a derivative and stabilised form of Vitamin C; it uses Sodium Ascorbyl Phosphate. If I had to restrict myself to just one serum forever, it would be the Illumina, hands down. That's saying a lot considering the skincare junkie that I am. It not only reduces my clogged pores but also any breakouts I may have. It also brightens the skin and has improved skin hydration levels too. After the five-day trial that I had with Illumina, I'm now seeing that I don't need to use it every night. I will now use it twice or thrice a week, sometimes skipping it for days together. If you missed out on this wonderful Boxwalla Beauty Box, make sure you keep an eye on their Instagram where they leave hints and subsequently announce their future boxes. I feel especially proud supporting a fellow Indian (Lavanya is of Indian origin) and I hope she becomes more popular with skincare lovers here in India. This review is my attempt to highlight her and the beautiful boxes she curates, and of course highlight these two amazing Moss Skincare products. Lavanya also interviews the brand owners and shares #skincarenerd facts and trivia relating to the products and the brand owner. It's all very exciting, I tell ya! This has to be the longest product name ever! But does the product live up to the hype-r long name? (see what I did there?!) Bad puns aside, let's dive in! In recent years, Just Herbs has emerged as a well-respected organic and wildcrafted skincare brand in India. 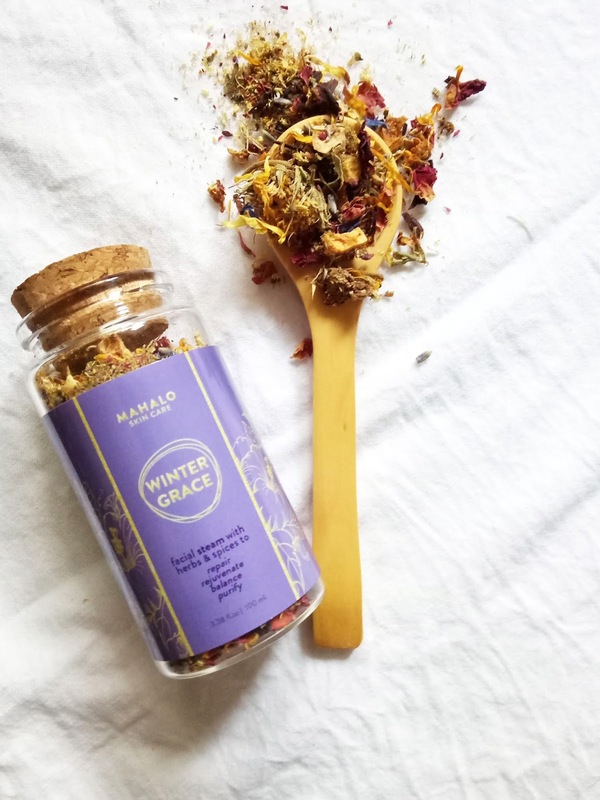 Its Ayurvedic approach to skincare and a line-up of products that fulfil the requirements of modern-day skincare routines has made the brand quite popular. What I mean by modern-day skincare routines is that Indian consumers, in particular, have only now begun to think beyond the three-step CTM (cleansing, toning, moisturising) routine. There is so much more to a skincare routine than simply using one over-drying face wash, one astringent-heavy toner, and one super heavy cream! Skincare needs have transcended these limitations and Just Herbs has recognised and more importantly, tapped into these needs by coming out with suitable products. This is why you will find in their line-up a cleansing milk for makeup removal, a ph-balanced hydrating face wash, cleansing grains or ubtan-like face cleansers, hydrating alcohol-free toners that also take away the remnants of makeup/cleanser if any, facial oil, face masks, gels, creams and a sun protective tinted moisturiser. But my introduction to this brand was a nifty 15 ml bottle of the Gotukola Indian Ginseng Rejuvenating Beauty Elixir Facial Serum. A few years ago, when Just Herbs had just come out with the aforementioned serum, I was intrigued. It was the first time an Indian brand had used the word 'serum' in one of its products. The texture was neither like a gel nor like a cream. The ingredients sounded impressive as they are revered highly in Ayurveda. It seemed like a recipe for success. I bought the product immediately, even though at the time, INR 985 was unheard of for a 15 ml skincare product in India. Ingredients-wise, I am seeing a few new ingredients. I don't remember seeing eucalyptus leaf extract, fumittory or colloidal oats on the product label of the bottle I had two years ago. Apart from that, the 15 ml bottle has a bigger sister now; you can now get it in a 30 ml bottle too. The price has also changed. Earlier, the 15 ml bottle was priced at INR 985; now, it's priced at INR 1125. The 30 ml bottle is priced at INR 1825. So, how does this new serum compare to its predecessor? As mentioned before, I'm loving the pump-style bottle, especially because the product seems to have an even thicker consistency than before. If you watch the video I had uploaded in my previous review, you'd see the texture being a mix of runny and thick. The product seemed to be almost 'unblended'. But now, it has an even texture and consistency, similar to many lotion-like serums available from other brands. I don't mind the new texture as the product sinks into the skin just as effortlessly. A big thumbs up from me! The previous formulation had a very pronounced 'sweet sugared bread' scent. The repackaged product has an overall scent that is sweet and herbal. I love it! Scent is such a subjective aspect and one that may or may not matter. However, I always like to include a note on product scent because I think it ultimately helps in making a decision whether to purchase a product or not. Having said that, the scent dissipates completely once the product is applied. Price-wise, I'm bummed that it has increased even further but like I said before, I don't mind using expensive skincare as long as it performs so I don't mind the price that much. In the long run, my skin thanks me for the 'skinvestment'. Having said that, this serum is still more affordable than many skincare serums I purchase from overseas brands. Now, the question that matters the most. Does this serum perform? Yes, it does! I can say this with confidence because when I was testing it, I did notice visible results. Whenever I test products like this, which are treatment products, I test them exclusively, meaning, I don't use any other skincare during the testing phase so that I can gauge the results clearly and do not mistake the results (whether positive or negative) with any other skincare product that I might be using at the time. The results I noted were: visibly brightened skin, a lit-from-within glow and diminished brown spots. Skin hydration was at its best when I was using the serum. In fact, this was the only product I was using for hydration and it didn't fail me. If hydration, brightening and subtle reduction in brown spots are your concerns, this serum is a good choice. 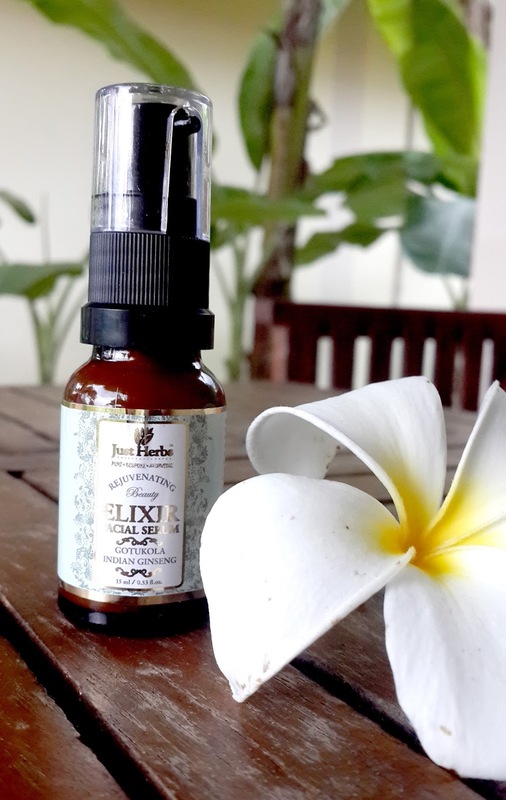 The Just Herbs Elixir does not help with reducing acne, which is fair enough because the company does not claim this in the first place. But in my experience, dehydration is one of the major causes of acne so if acne is a concern for you, this serum will definitely help. You can supplement your acne regimen with this serum as it would work in tandem with your acne-reducing products. Will I repurchase this? A resounding yes! I'm proud that an Indian skincare brand has a product that can compete with some highly-raved skincare products from overseas and more importantly, deliver on its claims. It is no wonder that this serum is a crowd favourite and the newer packaging has only made it better. You can purchase your serum from the Just Herbs site, or even from nykaa.com. I prefer buying it from the Just Herbs site because I'm assured of product freshness and also because I am entitled to free samples with purchase.